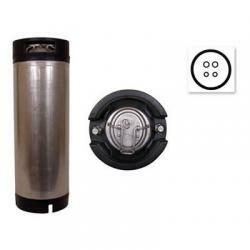 Ball lock keg, cornelius keg, pin lock keg or soda keg. Whatever you call it, we have it in new or reconditioned condition. Start kegging you homebrew for the freshest brew experience possible. The right keg for the right job! Bottling is consistenly people's least favorite part of homebrewing. Great Fermentations is proud to bring you reconditioned cornelius kegs so that you no longer have to bottle! These kegs have been given a light cleaning, have been pressure tested at 10 PSI, and had their o-rings changed out. They have pin lock gas and liquid posts that work with any standard pin lock disconnects. 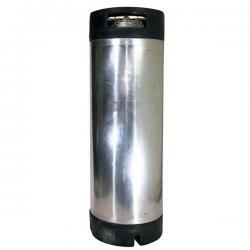 Made of high quality stainless steel, these kegs can last a lifetime if properly maintained. They are up to NSF sanitation standards, and we all know how important sanitation is in brewing! Pick up an extra keg or two so that you can accomodate all the beer coming out of your brewing pipeline. Some brewers prefer to differentiate their sour beers by using pin lock kegs so as not to cross-contaminate with their non-sour equipment. 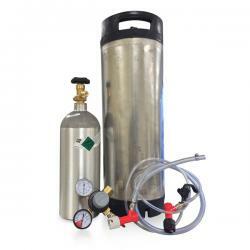 Perfect for pouring pint after pint of draft beer, kegging your beer instead of bottling is the best! NOTE: These kegs are used, and as such may have dings and scratches! They are sold as is, but can be returned if you're not happy with the cosmetic defects. All you'll be responsible for is return shipping charges. Also, they vary between one and two handle modles. Handle color may vary between black, green, and blue. If you have a preference let us know in the order notes during checkout. You asked for 'em, you got 'em! 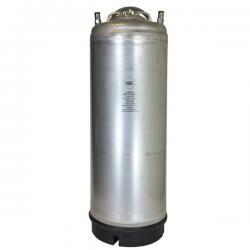 These brand new ball lock cornelius kegs hold 5 gallons of your delicious homebrew! 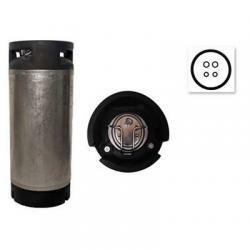 Made of high quality stainless steel to operate at a maximum working pressure of 130 PSI, these kegs are NSF certified, ensuring they are up to strict sanitation standards. The kegs have a single metal handle for ease of carrying and pouring, which is great for cleaning and sanitation. The gas and liquid posts are 11/16" size, with universal poppets. The keg lids have a standard pressure relief valve. They are roughly 26 inches tall to the top of the handle and have a diameter of roughly 8.5 inches. These kegs are the perfect size for standard 5 gallon batches of homebrewed beer, soda, sparkling water...you name it. A great brand new keg, available now! You asked for 'em, you got 'em! 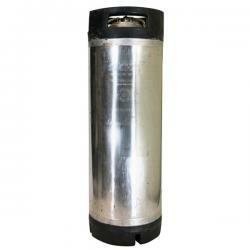 These brand new ball lock cornelius kegs hold 3 gallons of your delicious homebrew! 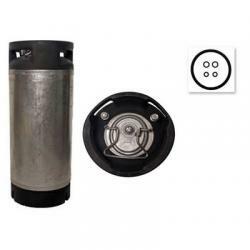 Made of high quality stainless steel to operate at a maximum working pressure of 130 PSI, these kegs are NSF certified, ensuring they are up to strict sanitation standards. The kegs have a single metal handle for ease of carrying and pouring, which is great for cleaning and sanitation. The gas and liquid posts are 11/16" size, with universal poppets. The keg lids have a standard pressure relief valve. These kegs are roughly 17 inches tall to the top of the handle, with a diameter of roughly 8.5 inches. These smaller kegs are perfect for doing smaller batches of beer, or splitting 5 gallon batches in order to bottle some and keg the rest. A great little brand new keg, available now! Tired of bottling? Cleaning, rinsing and sanitizing 50+ bottles every time a batch of beer is done fermenting can be a hassle. In fact, it is consistently rated as a home brewer's least favorite part of home brewing. Luckily, there is an alternative...the wonderful world of kegging! By kegging your beer instead of bottling, you only have to worry about getting one big container ready, as opposed to a bunch of bottles. Not only that, but you can force carbonate your beer, eliminating priming sugar and the possibility of bottle bombs. 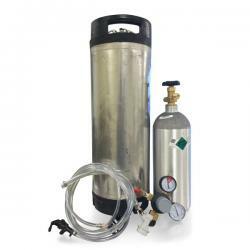 Great Fermentations' Pin Lock Kegging system comes with everything you need to keg and dispense your homebrew! The right keg for the right job! Bottling is consistenly people's least favorite part of homebrewing. Great Fermentations is proud to bring you reconditioned cornelius kegs so that you no longer have to bottle! These kegs have been given a light cleaning, have been pressure tested at 10 PSI, and had their o-rings changed out. They have ball lock gas and liquid posts that work with any standard ball lock disconnects. 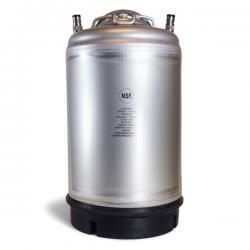 Made of high quality stainless steel, these kegs can last a lifetime if properly maintained. They are up to NSF sanitation standards, and we all know how important sanitation is in brewing! Pick up an extra keg or two so that you can accomodate all the beer coming out of your brewing pipeline. Perfect for pouring pint after pint of draft beer, kegging your beer instead of bottling is the best!